A secluded business park close to Chippenham offers a range of office spaces. The park is conveniently situated just off the Chippenham bypass, while the nearby M4 motorway ensures easy access to London and to the surrounding region. Situated in a very convenient location just off Junction 17 on the M4 Westbound and on the outskirts of Chippenham, this peaceful and professional office space is also close to Swindon, Bath and Bristol. Bright, airy office accommodation close to Chippenham. A variety of suites and offices available, with ample on-site parking and storage facilities. Nearby Chippenham town centre offers a full range of amenities, while the location provides quick and easy access to the M4 motorway. 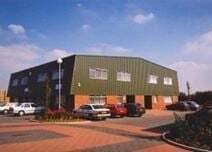 Situated in the outskirts of Chippenham, this centre offers a professional, high spec office space for tenants of all types. With an open plan design, suspended ceilings and central heating, the centre offers a high quality working environment. The centre is also graced with a great location, with easy access to the A4, A420 and M4 motorway, as well as only being seven drive into Chippenham itself and just 30-minutes from Bath.